Long before it became fashionable to be a two-sport star, Brad Vincent took it upon himself to be twice that versatile. As a four-sport athlete at Waynedale High School, the only thing that could stop Vincent was a knee injury, and that merely slowed him down for a while. By the time he graduated from the Apple Creek school in 1969, Vincent had earned a total of 15 letters in football, basketball, baseball and track and left his name indelibly etched in the Golden Bears record-books. Baseball was Vincent’s dominant sport. A slick fielding, hard hitting shortstop, he anchored both the Bears offense and defense. From his sophomore through senior seasons Vincent batted .455, .384, and.381, respectively, and led the team in hitting all three seasons. 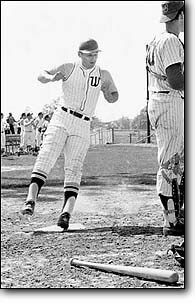 He was so talented that after graduation he played on a Hot Stove team that captured both State and National championships in 1970 and was invited to attend professional tryouts with Cleveland, Pittsburgh and Kansas City. Vincent was nearly as adroit on the gridiron. A two-time captain at linebacker-running back for WHS, he led the Wayne County League in scoring (88 points) his junior season. Vincent gained nearly 10 yards per attempt while rushing over 1,200 yards that season. On the hard-court, Vincent was also a high scorer and captain his junior year, leading the Bears with a 14-point average. A top sprinter on the track team, he lettered his first three years before a knee injury cut short his senior campaign. However, that merely ushered in a new sport for Vincent, who took up softball. He was the starting shortstop for the Miller Pipers for four years, and in that span the time amassed a sparkling record of 267 victories against 146 losses. The Pipers won the District championship all four of those years to advance to the State tournament. “During those years, Brad was one of the Pipers’ leading hitters for average and his slugging percentage was well above average.” Miller Pipers owner/manager Kenneth Miller said in recommending Vincent for the Wayne County Sports Hall of Fame. Vincent’s versatility and talent helped him to become one of Wayne County’s best all-around athletes.